With so many designs it’s easy to find one to fit your style. 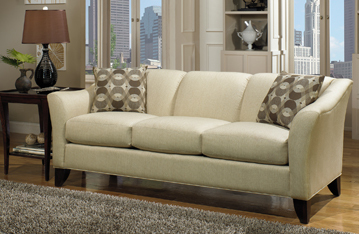 Upholstery that will let you relax, unwind and settle back in true comfort. A room your family will call their favorite place. GOOD UPHOLSTERED FURNITURE CAN LAST FOR GENERATIONS IF IT IS WELL CONSTRUCTED. Firm support and a soft touch – Inner coil spring units are encased with a medium density foam shell and wrapped with polyester fiber. Supple, plush feel – Medium density foam forms a supportive core that is surrounded by a super soft outer casing and wrapped with polyester fibers. Deep luxurious seat – On select products, we will add a poly-fiber or down-and-fiber blend top. The decks are tailor made using one of three construction techniques. 1 - Sinous coils, 2 - strong webbing, 3 - eight way hand-tied. Backs are meticulously filled with poly-fiber or down-and-fiber blends. Interlocking© frame techniques ensure reliability and strength. We use an Interlocking© frame construction technique that produces exceptional strength and reliability. The back rails of the seat and back frame are joined together with stainless steel bolts. Our frames are constructed from hand-selected choice hardwood solids, plywood or Larch solids.